Our favorite feline needed a name. After months of anticipation we settled the question once and for all. Also, Paddlers, stop trying to make Pinky McPinkface happen. It’s not going to happen. Mascots are big business. Some mascots have caused immense controversy, while others have achieved fame and even infamy, representing the company more than any living being actually working there. 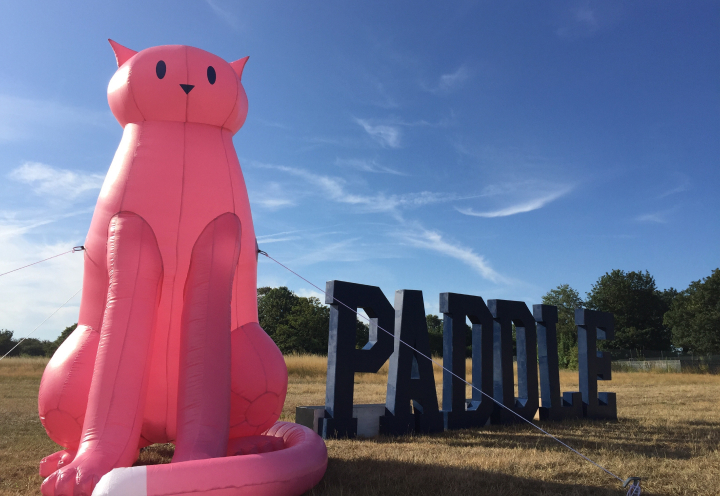 So when the time came to bestow a name upon the pink cat that has gently stroked its digital back up our collective legs and purred its presence into every online and offline aspect of life at Paddle — from stickers and custom emojis all the way to a full-blown (get it?) three-meter balloon — it was clear we needed to do this docile feline justice in true Paddle fashion. We asked each and every Paddler to vote for their favorite name (or, as we referred to it, pulling a Boaty McBoatface). All hail our feline overlord! Everyone’s vote counts the same. Everyone can suggest any name and the suggestions and winner cannot be overruled. 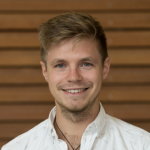 Everyone has full access to voting data (i.e. how many people voted for each name). Involving everyone is important to perception. We’ve seen this recently with the New Academy Prize in Literature, where a public vote replaced a closed off, secretive vote. For a company to claim openness and honesty, it’s vital to practise what we preach. 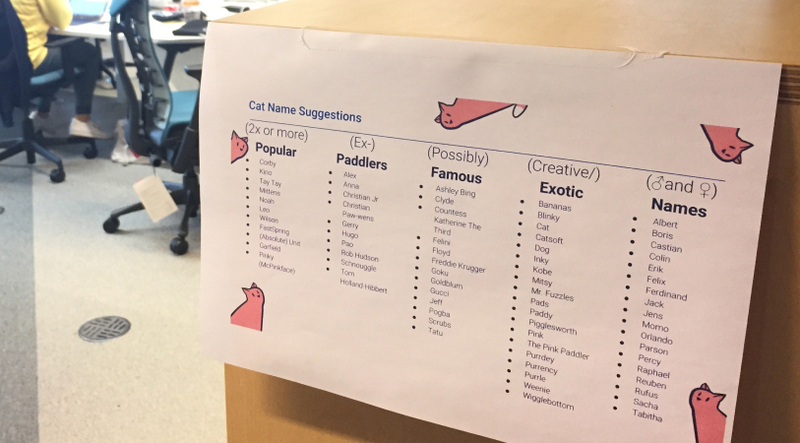 We did put a bar on epithets and potentially offensive names, however, which primarily discounted creatively twisted names including Chairman Meow, Kitler and Fidel Catstro. For all of their inappropriateness, they are pretty ingenious. Accumulate: Collect and cluster all name suggestions. Narrow Down: Have everyone vote for their two favorite names from the list. Fight: Depending on turnout, have a final knockout round where people pick their winner from a shortlist. Cat puns. Cat puns everywhere. 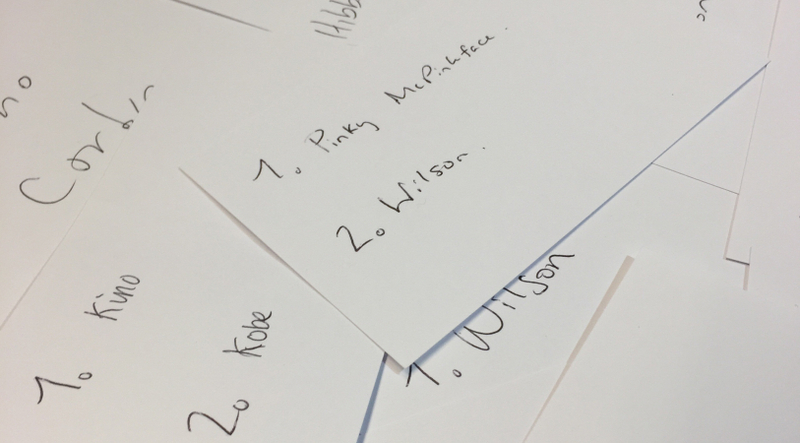 After suggestion polls were closed and the longlist plastered everywhere, everyone in the office was given a voting card to jot down their two favorite names. A hard-to-miss ballot box was set up near my desk. 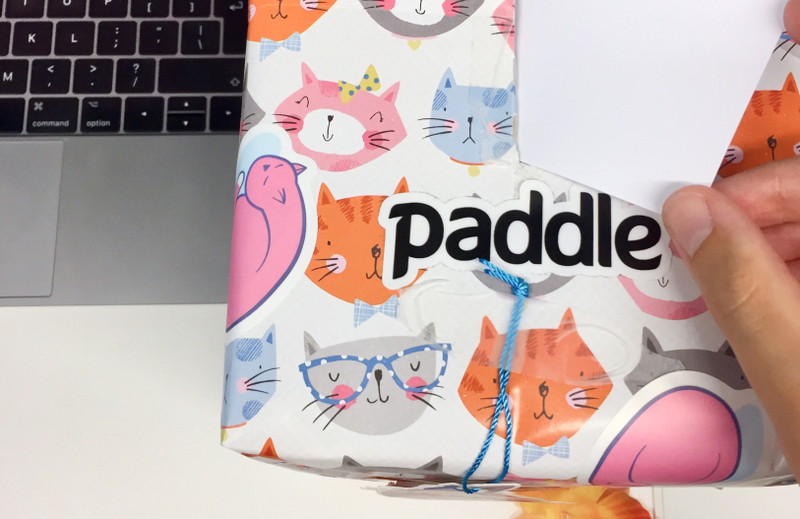 Kudos to whoever procured cat-themed gift wrap. We’re very open to remote working, so anyone out of the office could email in their choices. After counting the votes, two names popped up more than any other. Sorry, it’s not going to be Pinky McPinkface. Kino and Corby. Why these names, you ask? Both have a Paddle-related story: Corby is a town in Northamptonshire where our CEO Christian grew up and first started Paddle from his bedroom, while Kino is the name of the cinema and bar outside our current Bermondsey HQ. 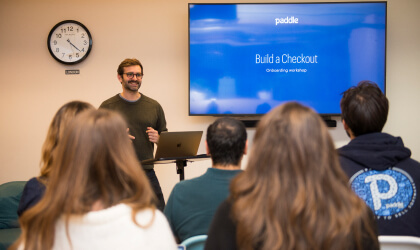 It was important to us Paddlers that the winning name, which would be unveiled during our first-ever Paddle Retreat to Osea Island, said something about our company roots. Why did we name our mascot? It encourages unity. We want to make sure that our time at Paddle is not only spent improving our work but also our relationships with those we work alongside. 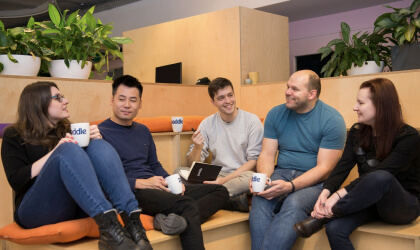 We’re scaling rapidly, but no matter the product or trajectory, we believe people stay around for each other. 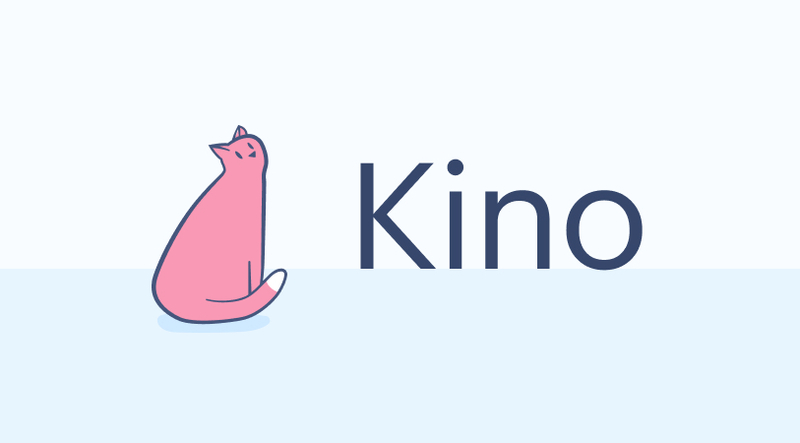 The Kino announcement was given a prime spot at our Paddle Retreat awards keynote, making it clear that the collaborative decision to name our cat has just as much validity as celebrating our other company successes. It reinforces our values. I asked our CEO Christian in our weekly business review if I could take this on and he replied, “Congratulations, you own this now!” Ownership and accountability are hugely important in a company and Paddle values this, whether we’re naming a cat, organizing events or getting sponsored to do certifications. It is this open and transparent grassroots approach that is exemplified in what we do with new activities every day. It means something to us. Kino is a place that we enjoy visiting together, both new joiners and Paddle veterans alike. 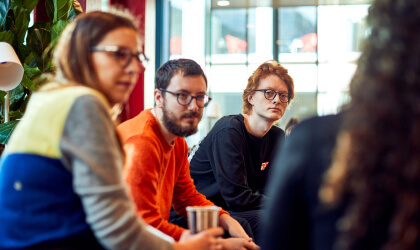 We sit at Kino for our weekly catered lunches, we rent out the bar for events, we come together there for after-work drinks. Aside from having the advantage of being gender-neutral, Kino symbolises a shared space that all of us are familiar with. It’s a place where we welcome new team members into the fold and, when we make the move to our new office space, it will be a welcome reminder of where it all started.